Pre-Fab Heaters - BORN Inc. The BORN “Pre-fab” heater is a tough, versatile unit that is shipped in completely assembled modules. It is available either with horizontal tubes or vertical tubes. The prefabricated and preassembled heater was developed in response to a demand for a process heater which could be shipped as a single entity or in modules or sections ready for field assembly. Units are available in sizes ranging from 200,000 BTU/hr to 500,000,000 BTU/hr. The unique feature of the Born “Prefab” heater is that it arrives at the job-site as completely preassembled units. This feature reduces field construction costs to the absolute minimum while at the same time giving quality process heater operation and efficiency. This unit has a true radiant tube section, thus assuring controlled radiant heat absorption, while the convection section insures high thermal efficiency. Design of the Born “Prefab” heater enables the natural flow of combustion gases upward from the burners with no obstructions, resulting in very low pressure drops so that adequate draft can be obtained with very short stack lengths. This Born design is based on over 96 years’ experience in designing and constructing heaters for the petroleum industry. Maximum efficiencies are obtainable with the Born “Prefab” heater. 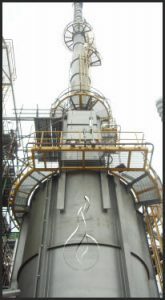 Flow of oil through the convection section of the heater is countercurrent to the hot flue gas, the coldest oil entering at the top of the heater and the hot oil passing out of the section at the bottom. With this type of process, the coldest oil absorbs the last available heat from the stack gas, which results in higher efficiencies. The special design and construction of the Born “Prefab” heater keeps the oil or other fluid being heated in the maximum temperature zone for a relatively short period of time. This construction feature also allows an extremely accurate and sensitive control of the temperature of the outgoing fluid. Actual recorder charts of many furnaces now in operation show that the outlet temperature can be maintained within ½ of 1 degree Fahrenheit. The heater structure is a steel frame and will support the entire weight of the refractory walls, tubes, headers, breeching and stack. The stack is a self-supporting steel stack superimposed on the heater structure. All shielded walls are lined with insulating refractories tied to the steelwork. These are either ceramic fiber refractories or insulating castables. The elevated air-cooled floor is insulate and reinforced for ample beam strength. The interior area of the breaching, including explosion doors, is insulated. Access doors are provided for the combustion chamber, the breeching and stack. The famous Born “Pre-fab” heater eliminates field construction and offers top efficiency – any time, any place, any size.